Sue Daley’s Rotating Cutting Mat! Hey Girlfriends! Kris here! This post is part of a series of our weekly “Fri-yay Weekly Demo” series! Our lucky local customers love our weekly in-store demos. Every week we have a new demo at our demo table! I am going to be sharing these demos on our blog, along with releasing the products for those demos every Friday! Now you don’t have to be local to enjoy our in-store demos! Read about last week’s demo about how to sew your own scrunchies here! and why every quilter needs one! I am obsessed with Sue Daley’s Rotating Cutting Mat! 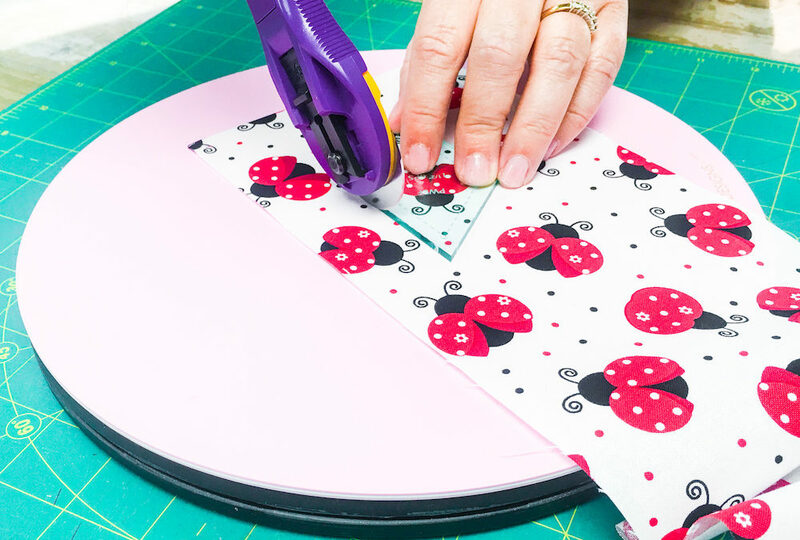 When my husband, Mike, first saw it he said, “that pink thing takes the fussy out of fussy cutting!” Gone are the days of getting the wrong cut because you constantly have to be repositioning your fabric and your ruler on your stationary mat. And even better?! This little 10″ mat travels with you wherever you are sewing! It is perfect for the piecer on the go! This week, one of our newest girlfriends, Carillisa is showing us how to use this genius little gadget! Click here to shop Sue Daley’s Rotating Cutting Mat for 10% OFF! February Stashbuster Challenge BONUS Pattern! Get to Know Your Baby Lock Imagine Serger! Our Favorite Features Of… The Baby Lock Evolution Serger! How to Use a Bias Tape Maker! MGQS on February Stashbuster Challenge BONUS Pattern! Bobbi Brown on February Stashbuster Challenge BONUS Pattern! jeandavis1219 on Embroidered Watercolor Cards!